It is really common for parents to have some sort of copy of their child’s handprints at birth. But what about the years that follow? In my son’s first year, I got the idea to continue the handprint tradition. We are now in our third year and the result has been something that we, as a family, really look forward to. The process is simple (as long as your little one cooperates ; ) and requires just a few materials. The result–a baby keepsake in the form of a canvas print. Paint canvas using the background color you chose (or you could just leave it white). Next, paint the inside of one of your child’s hands. Gently press hand onto appropriate side of the canvas. Repeat with other hand. Repeat project every time your child has a birthday. I plan on going as long as my son wants too (or until he turns 18!). 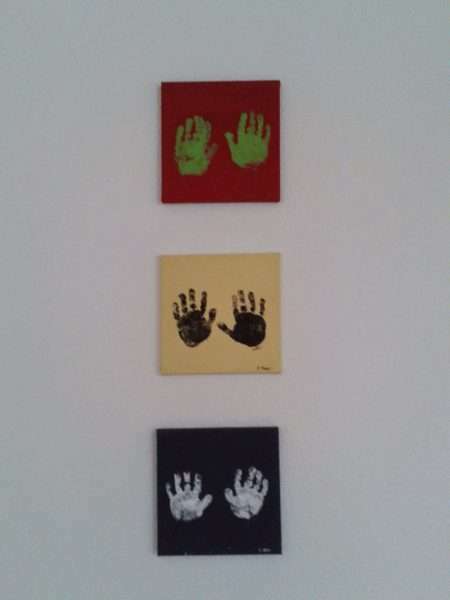 I think this is a great way to preserve your little one’s handprints when they are born and for the years that follow. Canvas is the perfect keepsake because it is durable, easy to dust off and it really makes for a fun display. My husband and I (and now my son) look forward to the birthday tradition. It is always exciting to compare his prints and see how much he has grown!